So here I am, back again nearly four years on from my last review, and I am effectively picking up where I left off because back when I gave up on this blog, the Parker Esprit was next in line for review. Parker launched the Esprit back in 2008, and some sites suggest the target market was businesswomen looking for a small relatively minimalistic but colourful writing instrument. First thing out of the box, a very nice protective carry case for your Esprit. That certainly does strike me as something suited to a ladies handbag. Open up and we have the mechanical pencil, or pen. It certainly is a bright colourful object in metallic blue and chrome trim. The Esprit is a telescoping design, so you carry it retracted and then you extend it to write. Officially to me it is a mini-pencil. 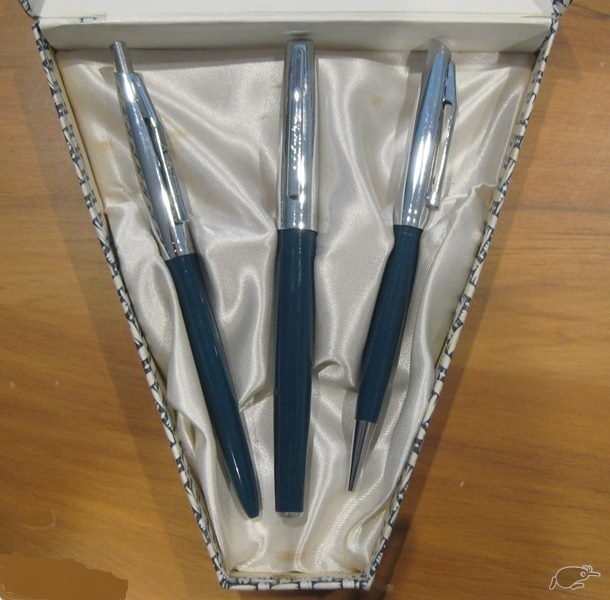 The Esprit is though fully functional when retracted, so if you just have to scribble a quick note or you are happy with a short pencil then the lead advances whilst retracted and you can write away. To extend the pencil you simply pull the front section out of the main body. It has a rather satisfying suction sort of feel as you pull the front section out and a definite stop at the end. You then twist the two sections through about a quarter turn to lock them in position. I really like the little graphic printed on the barrel showing the lead size and indicating the direction of turn to lock the extension in place. To retract you simply reverse the process, but that worries me a little. My Esprit mechanical pencil has a rather metal on metal sort of feel and sound during the retraction process and I wonder over time if somehow the barrel is going to get scuffed. I must stress there’s not actual physical sign of that; it’s just a suggestion from the feel and sound of it. If you are a bit heavy handed then when the barrel hits the retracting end stop you can accidently activate the lead advance. The lead advance mechanism is a standard push top ratchet. 10 clicks will get you 7mm of lead. As usual there is a small eraser under the top cap, and you remove it to access the lead refill chamber. The pocket clip is quite strong. In the hand the Esprit feels quite light. The grip section does not feel particularly positive and the ringed grooves are certainly a necessary feature. Well, I am not a businesswoman, and might not be the target market, but I liked the Esprit well enough. It is a lightweight colourful attractive interesting mechanical pencil for carrying around in a purse or bag. Apart from the carry case it’s certainly as unisex as most other mechanical pencils out there. I suspect though that Parker have decided the Esprit is on its way out so availability will decline. • Not So Good Points – Not pocket safe without the carry case. Dimensions – Length 124mm extended and 106mm retracted, diameter 10mm across the grip section. Balance point about 70mm up from the tip when extended. I shut this blog down a few years ago and took it offline a while back, but I have recently been trying to get my "pencil-life" better organized. Part of that has been the long overdue decision to reorganize (down size) my collection. Over the years I have ended up with a lot of stuff I don't really want. Things that looked good online but aren't in the hand, duplicates, minor variations, etc, etc, etc. Faber-Castell E-Motion - the one I'm keeping, although it is a make up of three separates in a flip top hard case. So, someone who knows about ink, why isn't the Faber-Castell nib gold?